We offer superior flat roof replacement in Birmingham, AL. Whether yours is old and beyond repair, leaking from storm damage, or you are seeking an energy-efficient upgrade, our team provides the expert installation and service you need. Flat roof replacement in Birmingham, AL, costs less money than having a pitched roof installed. These types of roofs are popular because of their ability to encompass the long, flat lines of a natural landscape. They are safer to get to and can be used as a place to sit and relax. Single-ply: These are made from a single layer of plastic or rubber. These materials reflect heat well, which can help lower air conditioning costs. Single-ply has grown in popularity over the past 30 years, due to its flexibility, relative ease of installation, and competitive price. Multiple-ply: These are made from felt rolls or mats that are separated between asphalt layers. A top layer of gravel or small pebbles is then applied to protect against damage and exposure. Modified bitumen: For flat roof replacement in Birmingham, AL, choose this mix of asphalt and a polymer. It resembles single-ply but is installed in a similar manner to multiple-ply. It is covered in a layer of gravel or other protective coating, such as certain liquid coatings that reflect light well. Modified bitumen systems can be one-, two-, or three-ply. Flat-seamed metal: These are made out of sheets that resemble tiles or shingles. The sheets, which are generally composed of copper or steel, are then soldered together to create a cohesive roof. The lightweight and light- and heat-reflective nature of the materials make them long-lasting, effective and aesthetically appealing. Roll asphalt: This entails rolling asphalt-saturated felt over a base felt layer. 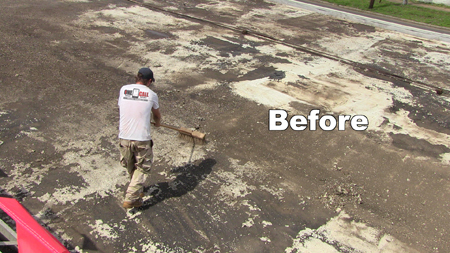 After the asphalt is rolled, it is then either nailed down or covered in cold asphalt cement and then finally covered in gravel or some other protective layer. There are four basic kinds of materials: smooth surfaced, saturated felt, specialty-eaves flashings, and mineral-surfaced. When it comes to low sloped or flat commercial roofs, One Call is the affordable and reputable choice to get it replaced properly. We don’t cut corners on preparation, installation or the cleanup afterwards. 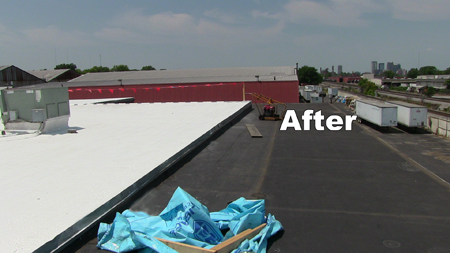 So, if you have a factory, school, church, warehouse, restaurant or any other type of commercial building, let us provide you with a free written estimate to replace the roof. 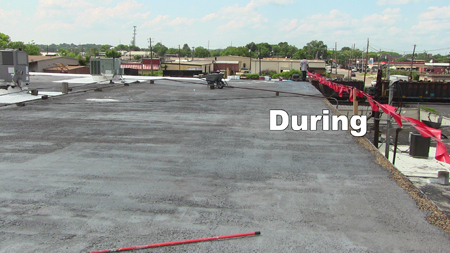 We provide flat roof replacement in Birmingham, AL and the surrounding area.